The experienced and expert crews at EverLine’s Saskatoon location can install parking blocks and speed bumps for all types of parking lots and parking garages. Let us help you improve the safety of your property. Parking lot protection and safety is a crucial part of any parking lot’s initial planning or maintenance plan. One aspect that is often overlooked in these plans is the importance parking blocks and speed bumps. Parking blocks and speed bumps protect your property and the people who use your parking lots. A great way to protect the curbs in your parking lot and control the parking layout is the use of parking blocks. Regardless of the unique or difficult layout of your parking lot, we can strategically install parking blocks to suit your property’s needs. Another point of concern is regulating the speed of vehicles within parking lots. 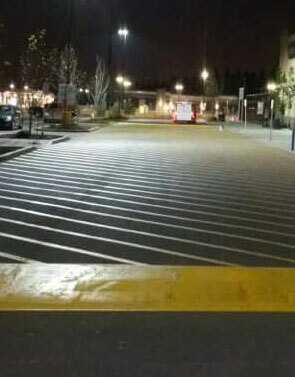 Speed bumps are a great way to control the speed of vehicles and ensure the safety of your tenants, staff or customers. Our crews have years of experience and can help determine speed bump placement and dimensions for the best possible results. When you choose EverLine for your parking block and speed bump installation services over our competitors, you get the EverLine advantage. We only use the best blocks, bumps and hardware in the installation process to ensure you get a lasting parking lot solution. We only use durable, reflective, Canadian made parking hardware in our applications. These blocks are durable, effective and noticeable. They do a great job of protecting your property and it’s users. To ensure our clients are more than satisfied with the work we deliver, we are completely transparent every step of the way. This is why we operate using the CORE quality system. CORE stands for clear scope, operations reports, reach out evaluate. By adhering to this quality system on all of our projects we are able to guarantee satisfaction for our clients. Both parking block and speed bump installations are processes that require a substantial amount of planning on our end. We thoroughly evaluate each property to be sure we have considered all the potential safety factors to create a solution for your property. When you choose EverLine, you get the EverLine advantage. We use nothing but the highest quality materials and our highly trained crews to get the job done. We’ve got decades of experience in the parking block and speed bump installation business. We’ve worked with some difficult projects and we’re ready to handle anything you can throw at us. To ensure an efficient, timely and effective installation of your parking blocks and speed bumps, we have a few steps we ask our clients to undertake in preparation. If the parking lot needs to be cleaned before installation, please inquire about our lot cleaning services. The safety of our installation crews and delivering you a good service is our top priority.